It was obvious that Gabrielle Christina Victoria Douglas was going to be a talented athlete from a very young age. Her sister Arielle taught her to do cartwheels and then “Gabby taught herself to do cartwheels one-handed.” She was only four years old at the time, a little gymnast in the making. Gabby practiced all the time, but with her little accidents, it “became clear that she needed lessons.” Her mother, Natalie, wasn’t convinced that it was the way to go because with all that flipping around Gabby could seriously hurt herself. She finally relented and young Gabby started gymnastics lessons, lessons that would eventually launch her into the world’s spotlight. Excalibur Gymnastics in Virginia Beach was her jumping off point, but in 2006 when she went to “gymnastics camp at the Karolyi Ranch near Houston, Texas” her talent was evident. Gabby had her own plans and wanted to eventually train with Liang Chow in Des Moines. Once again it was a hard decision for her mother, Natalie, but in 2010 Gabby moved to Iowa. At the age of fourteen, it was a tough move and she “cried and cried.” Homesickness had set in, but once she settled down, Shawn Johnson and Coach Chow “quickly helped Gabby mold her raw talent into world-class gymnastics performances.” You’ll read about her competitions, her setbacks, the London Olympic Games, and much, much more about “golden Gabby,” an amazing athlete! This is a fascinating look at Gabby Douglas, one of the best gymnasts in the world. Any young fan, especially budding gymnasts, interested in the sport, most likely had their eye on Gabby during the 2012 Olympics. Her indomitable spirit and infectious smile captured the hearts of people around the world. This beginning chapter book has full-color, captioned photographs, and a few sidebars interspersed throughout the book. For example one briefly discusses her nickname. Difficult words and phrases such as “all-around” are highlighted in bold print and defined in the glossary. In the back of the book is an index, a glossary, career highlights (2002 to 2012), and additional recommended book and website resources to explore. 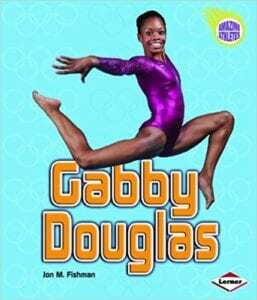 Quill says: Young gymnasts will undoubtedly enjoy learning about Gabby Douglas, a "pint-sized powerhouse" in the world of gymnastics!